Hanoi city is full with street vendors. They ride their bicycles or motorbikes at low speed through the residential streets. Most are equipped with a tape recorder and speakers that repeat permanently what is on offer. This goes on till midnight even. Things on sale range from fresh coffee to sticky rice with add-ons. Apart fro the usual stuff this morning I heard to guys passing on bicycles. One of them was offering rat traps. The other one hat a few cages fixed to his bike and was announcing that he was looking to buy cats and dogs…You may guess for what purpose! 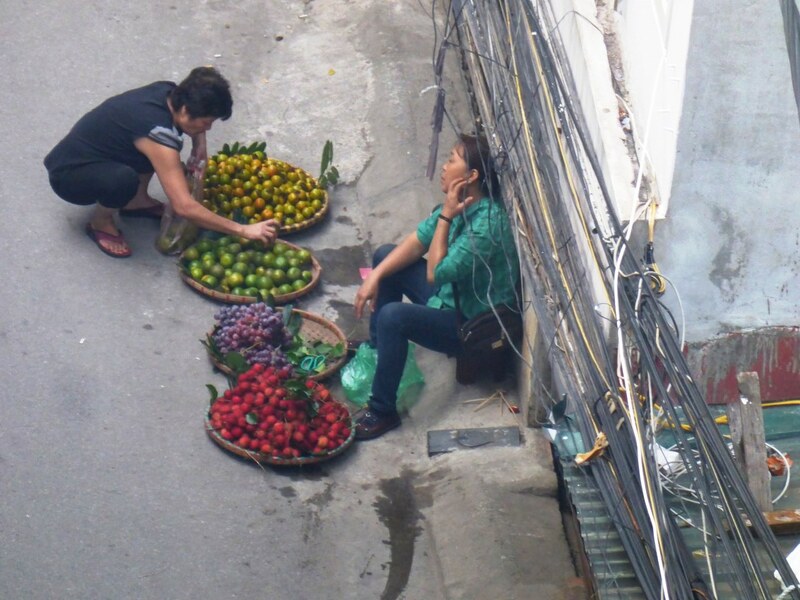 There are also always a lot of women in my street who settle on the narrow side-walks to sell fruit – like mandarins and oranges. That makes everything very personal and charming.